Some members of the Peoples Democratic Party (PDP) in Osun State on Thursday stormed the premises of the state high court, raising an alarm over the alleged disbandment of the 3-man election petition tribunal. The panel was set up to adjudicate complaints arising from the conduct of the September 22 governorship election. At the court premises, the doors leading to the courtroom were under lock and key while the registry of the election tribunal was also shut. 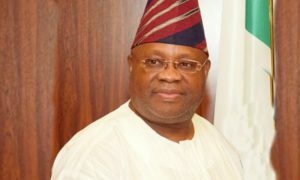 One of the counsels to Senator Ademola Adeleke, the PDP candidate, Mr Niyi Owolade, told journalists that they came for the hearing of an application on substituted service but were told by court officials that the panel had been disbanded. Owolade said “We filed our petition on Tuesday, 16th of October and we tried to effect service to the three respondents, namely INEC (1st), Gboyega Isiaka Oyetola (2nd) and APC, being the (3rd) respondent. “While we were able to serve the 1st respondent, the 2nd and the 3rd respondents declined service. So, we brought an application here yesterday for substituted service. The application was to have been heard 9.00 am today (Thursday), but we were surprised when we heard that the panel had been disbanded. What is even more surprising is the fact that you have disbanded and you have replaced. “We all know that election petitions are swis generis. Our 180 days starts on the 16th of October, which was the day of filing, Section 285, Sub-Section 6 of the constitution of the Federal Republic of Nigeria as Amended is clear about. So, judgment is to be given on or before 18th of April, 2019, I mean the final judgment. “But, if you have 180 days which has commenced and we cannot effect service which the law allows (of which order we would have gotten today has been denied), we are surprised that the President of the Court of Appeal saddled with the responsibility of empanelling election tribunal has not deemed it fit with greatest respect to her, to have put in place a new panel simultaneously. We are surprised that we don’t have a new panel yet. We hope that would be done soonest”.